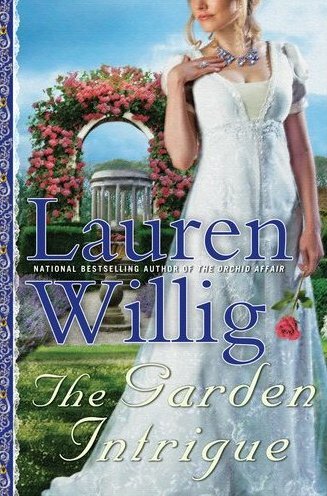 Passages to the Past is pleased to announce a new giveaway for an ARC of The Garden Intrigue, the 9th book in the Pink Carnation series, by Lauren Willig! Due to an oversight I received two copies of this exciting novel, so I am passing the love on to one of my fabulicious followers! - Giveaway ends on February 20th. I rather assume you mean the invasion of Britain or would it be all right if Napoleon conquered Scotland and Wales as long as he left England alone? Sorry, pet peeve. England is quite definitely not the only nation in the British Isles. I am wondering if this is an error that the author made as well. It does sound like a somewhat different take on the usual Regency novel, which heaven knows need refreshing. I love historical novels and would love to read this one. I asked to join the FB page: Lisa Holmes Garrett. This book sounds like a great one and would like to get this please. My email address is SculptFire4ev03@gmail.com. This novel looks like an exciting story! I would love to have a copy! I'm a memeber on Fb! :) My email: shopkins123@yahoo.com. I've enjoyed reading Lauren Willig's books and anticipate getting a chance to read THE GARDEN INTRIGUE. I lived in Paris for many years and love the history of that country. Napoleon was such a complicated man and I enjoy reading about him. This plot sounds very good. Thanks so much for the synopsis. I love this series, thanks for the chance to win this one! I love this series!! I own alp the books so far and it would be amazing to win this one to continue my collection. I am a follower and I also follow you on Facebook. I'm a follower of your fabulous blog as well as your FB page.I think I'm a twitter follower too, or will be in a second, if I'm not already. I'd love to win Lauren's latest triumph! I think I should win this book because my paternal grandmother (God rest her soul) was named Emma Morris. She would be thrilled to see her name in print!! Love your blog, btw. I've bought many of your recommended books and enjoyed them all. So much, in fact, that I've written my own historical novel...The Unexplored Heart. See my blog for this novel: http://TheUnexploredHeart.blogspot.comHope that's right. This sounds like a book I will enjoy very much. This book looks so interesting! Thank you for giving away the extra copy and writing about it! (I follow your blog with blogger.com too). Ooohhh I love this series! Please enter me in the giveaway! I am a longtime follower and follow on Facebook as well! I would love to add this book to my shelf. Lookng forward to reading this series. I love this series and I would love to win this book!! Also, I have just found your blog and have to say that I have signed up to receive email alerts..seems we have very similar reading tastes, so I;ll be checking in to see what youre up to.. I add this to my TBR pile after seeing it on GR. I had no idea it was number 9 though! Is it ok to start with this one or is it one of those series where you should start at the beginning? I have all the others in this series and would love to have this latest one! She is an amazing author. Thanks for the chance to win! I'm a GFC follower and Twitter follower (@susanaudrey). I love Lauren Willig's books, so I would love to win this! Love this series!! So excited to be entered in this giveaway! Laurent Willing is my favorite author. I'd love to win this ARC! Hi, Thanks for the contest. This looks like a great blog! Wish my computer wasn't allergic to blogspot!! The Garden Intrique sounds wonderful. Please enter my name. I follow on facebook and the web. Please include me in this great giveway. I'm a long time follower of this blog, follow on the facebook page, twittered about this giveaway and also shared on my facebook page. She's the reason I read any of them today! Thank you for always offering your kind giveaways, Amy.